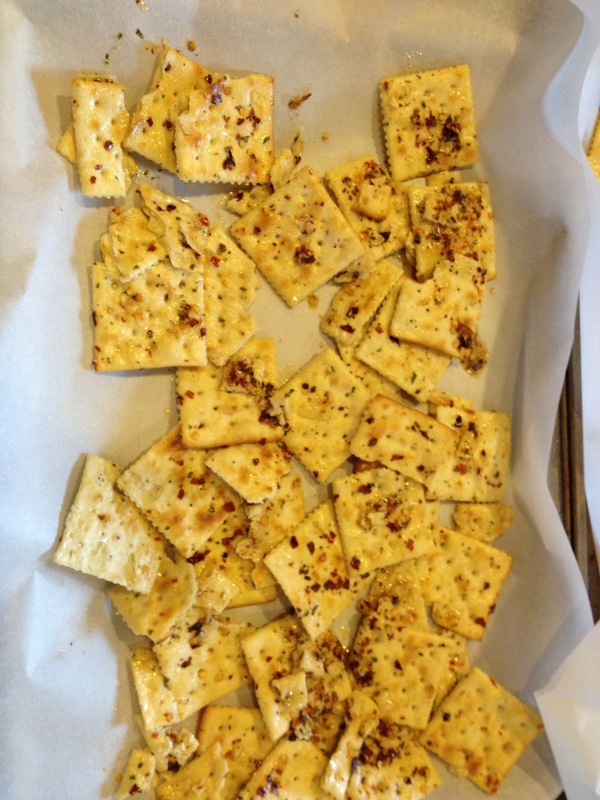 My friend, Cheryl had a pajama party over Christmas holidays and one of the things she made for us was Fire Crackers. I LOVED them. I heard how easy they were to make and decided this is something I would have to make for our Super Bowl party of three. When I put the Saltines in the grocery basket at Central Market, my husband and father-in-law laughed at me. What could I possibly make with Saltines!? Well, after I made them, they took back all the ridiculing that they had done. I think this is their new favorite snack. I bet that we’ll be having these at all future parties!! 1) Mix all the ingredients together in a bowl for a good long while (5-10 minutes), to really get the crackers coated. Eat a few if you want. 2) Lay them out on a cookie sheet, (doesn’t have to be orderly), and drizzle the left over mixture left in the bottom of the bowl over the top of the crackers. Bake at 250 degrees for 15-20 minutes. 3) Put them in baggies for later or serve. Since I made a whole box of crackers, I had plenty of these to share at work this week. One of my friends told me that she makes them, too. She uses the low fat saltines. She said that mine were crispier. She also mentioned that she doesn’t cook them and lets them sit out and soak for 2 or 3 days. I’m pretty sure that cooking them makes the difference. Happy snacking! Please make some for me when you come to visit. Iknow they're not too hot.